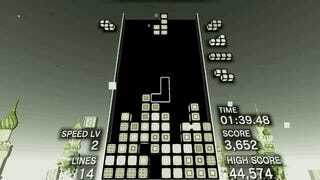 The first game I ever owned was Tetris for the Game Boy. I sucked back then, and I’m not too hot now, but nearly 30 years later I have a chance to go back to that experience thanks to an 8-bit level in Tetris Effect. 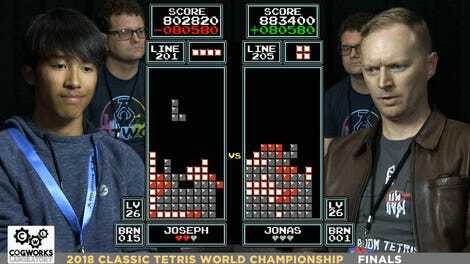 Tetris Effect’s Game Boy themed level was first seen during the game’s first “weekly ritual,” a weekly event in which players can cooperate to earn a global score to unlock new content and special swag like in-game avatars. This week’s weekly ritual included a level that let players kick back to the old-school visuals and sounds in Effect mode, the non-story portion of the game. It features monochrome blocks and a version of the iconic “Theme A” that reacts to player inputs. Now that the weekly ritual is over, the level is permanently unlocked for anyone who reached level 50. I just finished Tetris Effect last night at a novice setting and ended up at level 50, while our resident Tetris freak Paul sat at level 32 this morning. It might be a bit of a grind to unlock, but we’ll hopefully see this and maybe even more new levels as players. For now, I’m eager to play this level and get a huge score. My grandma was always great at Tetris. Now that I can revisit its classic look, maybe I can finally be that good too.